Hello dear friends! 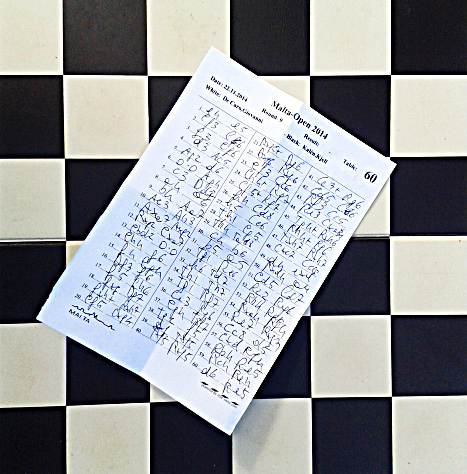 This time there will be a special post in which instead of travels I will talk about Chess. 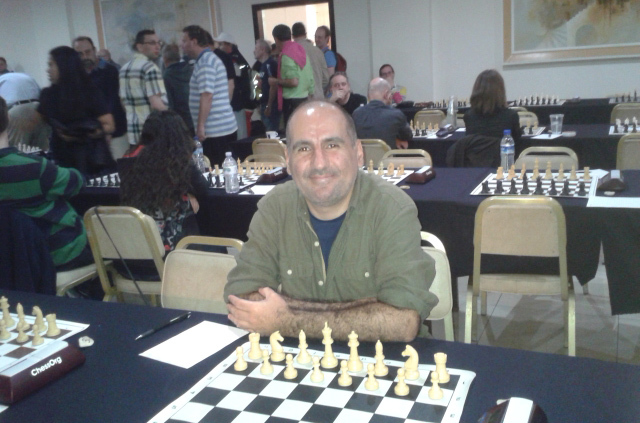 In fact, your favorite blogger is also a chess player and then decided to participate to the Open Chess Malta tournament held between 16 and 22 November. A very high level tournament with 3 Grandmasters and 5 International Masters. 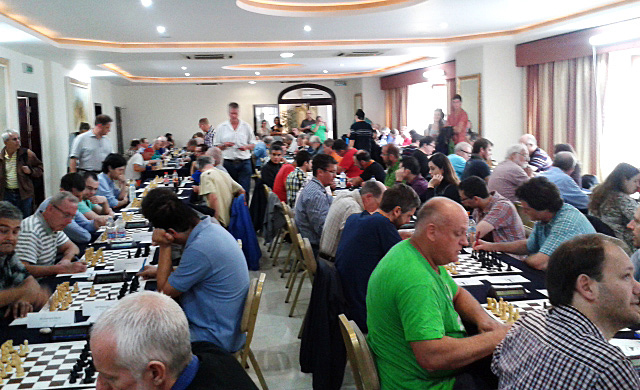 In total there were 167 players from 30 different countries of the world. At the end, won the young Mongolian GM Gundavaa Bayarsaikhan (some info here) with 8 points on 9. Second the Swdish IM Björn Ahlander with 7.5 points and third the Bulgarian GM Marijan Petrov with 7 points. I arrived 115th, with 4 points (4 matches won and 5 lost, no draws), respecting the 119th position of the Initial participants list based on the players strength. This is the Final Ranking, if you want to see more info about the tournament go to This page and click on the “Bulletin” on the right, there are also some selected matches. Since in the last post I talked about poker, let’s try to find some difference between the two games. First comparison: Poker is inextricably associated with the word “luck”, Chess with the word “intelligence”. And it is maybe for this that poker has become so popular in these “gutless” days. Because poker players can say uhhh I’m very strong but bad luck haunts me uuuhhh I’m a genius but the card shuffle is rigged uuhhhh I did the best bluff of the century but the opponent being weak didn’t understand my sharpness and therefore won, and other similar delirium, while in chess there is no excuse holding. So the poker player can pretend, especially to himself, to be a champion, also confirmed by the fact that occasionally it happens he wins for real. While, when he lost – that is almost always, it is just due to bad luck, plots and opponents that win because he is too strong for them. We chess player instead must face the sad reality of being duffers. Apart from the few real true champions existing, of course. Another difference: the poker player plays for money, this is the purpose. The chess player doesn’t play for money because at maximum can reach some small money prize in a tournament. Plays for the sake of playing, to create a nice match, and when loses valiantly against a stronger opponent is still happy, something that does not exist in the poker player defeated. It come then natural a second division, this time of class, in the proper Marxist sense: the Merchants and Bourgeois play poker, we Aristocrats prefer chess. Yuuuhuuuhh, well of course now I don’t want to make cry my many poker players friends I’m knowing in these months. And especially I don’t want that my Company, seeing me talking always against Poker, gets angry with me. No no. Poker is a very beautiful game. And very complicated, among other things. To calculate the probabilities of the outs it is necessary to multiply by two, and sometimes even by 4! Oh my God. Ok, and now the 9 matches I played, with some brief comments. The number you see near the player name is the ELO FIDE, that is the official chess player rating. Before the tournament I did not have an ELO FIDE because until some years ago they were assigned only from the Master category, so I had the national (Italian) one, that is 1694. 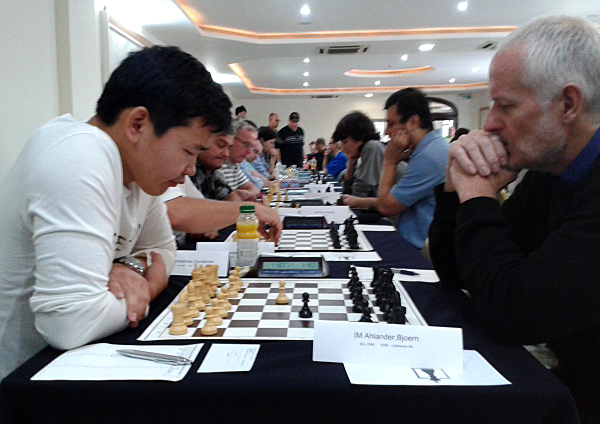 Now, after this tournament I have also the ELO FIDE rating, and it is at moment 1690. It was one of the longest matches of the first round, over 4 and a half hours of play. Generally, the opponent chose the Alekhine defense where the Black puts purposely his Knight under pawns attack for creating weaknesses behind their advance. But I preferred to do my usual setup of pieces when I play with White, that is g3, Bg2, O-O etc … a system that I can use against virtually all defenses, allowing me to not need to study them. Black soon began to attack (9 … f5) and I purposely invited to threaten my pieces with pawns (11. 13. Bg5 and Kh4) because I was hoping that in doing so he would weaken enough the castle to permit me to fight back (kind of similar to the Alechin defense idea then). But unfortunately I could not or wanted not do that, I didn’t feel to push in h4, I attempted an attack on the Queen side, soon blocked and at a certain point the opponent was able to push one of his advanced pawns (25 … f4) putting me in trouble. There were many tactics threats and I lost a pawn. I entered into a lost final that the opponent played with great precision and there was nothing to do for me. In the last move I’m in zugzwang, that means that if I could just stand in that position I had no problems, the black could not progress, but being forced to move I need to move the King and I quit. The game is also here: http: //en.lichess.org/6bfwjB0b#1 with some computer analysis, a bit strange as always, and it did not analyze the entire first part that I think was the most interesting. A match against a Maltese guy. Soon I have a advantage in developing and to avoid a fork the opponent moves his Bishop in a trapped position. After, maybe to have some counter-play decides to take the pawn back with the Queen, but soon also the Queen is almost trapped and to save Her needs to give a Knight. After, I get a third piece. The first of the two matches played during the same the day, this one against an Englishman with 1918 ELO points. He chose the French defense but, as I have already said, with White I usually make the same setup (obviously sometimes I need other moves before, here for example I had to play 3.Nd2) . Practically I use the White’s move ahead as gift to not having to study the various Black’s defenses. At one point, the position was more or less equal, however, since I had some harshly critics from some friends for playing too soft the first game (friends that woke up as chess player experts just in occasion of my tournament I have to say) I decided to attack (21.Ng5 and 22.Qh5) if the opponent played h6 on Ng5 I had already decided to sacrifice it on f7 (and after Qh5+, Bh3 threatening the pawn, and maybe Rook up on e3 – f3 etc…). With 22.Qh5 the die was cast because at that point the opponent gains material and if my attack on the King goes wrong I lose, as unfortunately happened. Here there is the game with some computer analysis: http://en.lichess.org/5goUBWzj#1 and apparently there were not many opportunities in my attack. With the move 28… Qd4 I’m forced to Qf3 and at that point Ne5 is winning. I’m White. Black is a player from USA, 1805 ELO, and chose the Sicilian defense. I do my usual setup (that is the King Indian attack, as a King Indian played with White). Soon I start attacking and with 21 f4 I have a strong attack but unluckily for me the Black has some counter-attack with his Queen in b2. A very fun match anyway, see for example 23 Kxh6+, very spectacular. At the 28th move I think a lot because I felt that, due the position, I have a winning move. At the end I played 28.Rf3 threatening the mate in g3, I was thinking also Rf4 to avoid the Black Queen check and move it after on h4 threatening the mate from there. But Black defended well and shortly after it was me to be in mate danger. Here there is the game with the computer analysis: http://en.lichess.org/mxNrP0kU#1, as always the computer in these tactic positions goes with long science-fiction variants but I could see that there was the winning move in that position: it was Kh1, leaving the g1 square to the Rook, strange I didn’t see it as it is a typical manoeuvre in that kind of position and it would have also avoid the annoying check, but for some reason I was keep thinking to bring the Rook in attack moving it up. Apart from the computer analysis, in that moment there are a lot of tactic fun variations, often based on who mates first (see for example the one Qxc2 etc…). After all the tactics storm we entered in a final where I was slightly at a disadvantage, but I played it very bad, first with axb and after with a proper blunder, 41.Re2 where I lost. I was a little tired at that point and also psychologically I would have preferred to win or loose before during the attack. Starting everything again from scratch in the new position dejected me. This time I had to win, no excuses, I’m White against an opponent with a lower ELO. But it was very difficult, I did my usual opening but it didn’t go very well. With 11 … h6 I had to be careful to not have my Bishop trapped, but I didn’t want to move the Knight and going on defensive then I preferred to counterattack sacrificing a pawn with 12.d4, with the idea to compensate it with an active development of pieces. The opponent, however, for some reason at the end didn’t take the pawn, so I had the pieces well developed without not even any material loss. I gained a pawn and started attacking. Some positions seemed easily won for me, but actually they were not (as in fact the computer analysis confirmed: http://en.lichess.org/24lZaAqy#1 ). The reason is that with Bishops of opposite color and no Knights on the board, some squares are very hard to defend and usually each player gets total control of some squares of own bishop’s color without any power on the ones of the other color. Another problem for me was that the finals with opposite color bishops are tie when there is only a pawn advantage (and sometimes two) so I had to win before reaching the final. At the end of a long assault, anyway, I managed to win. I’m Black, the opponent is a German woman 1988 ELO points. A lot of action since the beginning, I play the King Indian and the opponent chose the 4 pawns attack where the White move all 4 central pawns ahead, with the Knights behind, but don’t be scared when you see it, it is everything under control. I chose a less played variation 6… Na6 (the most popular line is 6 … c5) and shortly after, when she played 10.Qc2, I remembered that there was some tactical trick to get a positional advantage. I didn’t remember exactly and I had to find it again there, and it is 10… Nfxe4, based first on a pinning and later on a fork (or, in case defends with 12.Nfd2 there is Qh4+). Shortly later I took her Bishop with the g pawns instead of the Rook, maybe with some cockiness. The reason is that I wanted to prove the theory of Yin / Yang, the opposites that alternate, and so I liked to see that after only a few moves was no longer White but Black to have the control of the center with pawns. After I placed also the Knight in e4. I think I had some positional advantage and tried to attack. In particular, in the 25th move I played 25 …e5, rather than the more obvious …Rc8 because I thought that if White used that little tactics to win a pawn, after Qe5 (followed also by Rb8) I had a extraordinary attack on the King. But the following move 28.Ng5 surprised me, it’s a move by many threats, in particular a sequence that leads to a Knight mate in f7 after a Queen sacrifice (for example Qc4 check, Kh8 -otherwise there is mate in f7, Nf7 check, Kg8, Nh6 double check, Kh8, Qg8+ Rxg8 and Nf7 mate). But I did not see that the simple Rf8 actually defends well against the attack because, after Nf7+ Rxf7 the Queen can not take the Rook since needs to keep defending the b2 square. Unfortunately then I played Kf8 and from there started a very strong White attack that at times seemed fatal, such as for example at the 32th move where I expected simply Rd2, and maybe I would have resigned. For some reason she played instead Nxg7, perhaps not seeing that the Queen could escape with a check, but anyway soon after we entered a Rook final where I had two pawns less and of course I lost. The game is also here href=”http://en.lichess.org/JFzU9Px8/black” http://en.lichess.org/JFzU9Px8/black with some computer analysis. One of the two tournament rooms. The first chessboard at the last turn. On the left the winner, GM Bayarsaikhan and on the right the second, the IM Ahlander. The match lasted just 7 moves!! And that is! A very nice and fun tournament, and please keep following your GiancuMaster, as are starting to call me here (that comes from “Giancu” the nickname I have here in Malta that is short of “Gianculoso” my Poker online UserId, coming from “Giandecaro” that I don’t remember when and where was given to me… in brief my future biographers will not have an easy task for sure!!). This entry was posted in chess and tagged chess by Dekaro. Bookmark the permalink.